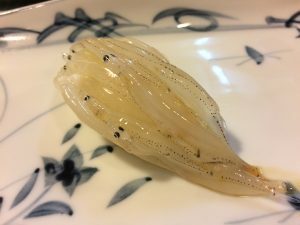 In some cases, the strong belief that fish is only about freshness, may prevent you from tasting the true value of the fish. For example, slicing up a fish that was just swimming, in front of the customer. 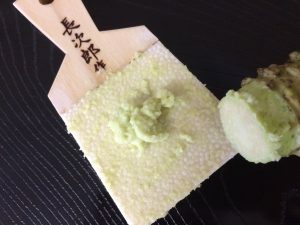 The umami flavor is weak at first so while the texture is tough (a unique, crunchy feeling), the flavor is lacking. But the idea that freshness is equivalent to deliciousness continues still. This is a typical case of faith in freshness overtaking the actual taste. 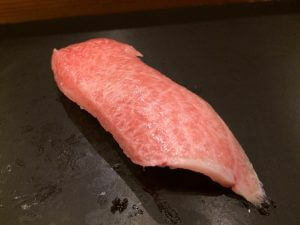 What is the difference between the taste of marbled and lined fatty tuna? 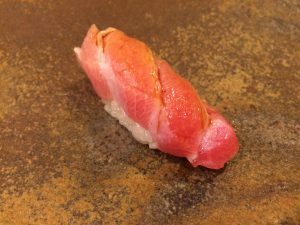 Marbled tuna is the part in which it looks like the fat has fallen like a frost and melts like snow on your tongue then leaving only the umami taste. 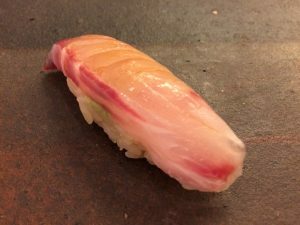 The lined fatty tuna (jabara) is the part that has white fat lines running through it and distributes a surge of aroma and umami flavor throughout the mouth. After that the potent fatty umami fills your mouth. The way the fat melts in your mouth differs, so everyone has their own preference. Posted on April 9, 2018 Categories EdomaesushiTags Edomaesushi, Fatty tuna, Maguro, Nigiri sushi8 Comments on What is the difference between the taste of marbled and lined fatty tuna?